Credit: This is an edit of Lupa Mooncak's (another anagram of real name) document, published with permission. Thanks Lupa! Browse to the .ova file, and follow the wizard (mostly next, next, next ...) to import the CAG (Citrix Access Gateway) VPX to the virtual infrastructure. 1: Before booting it up, choose the networks that the CAG will be connected to. 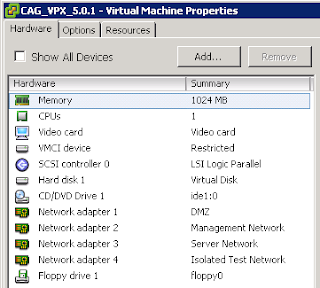 The CAG comes with 4 virtual network adapters. 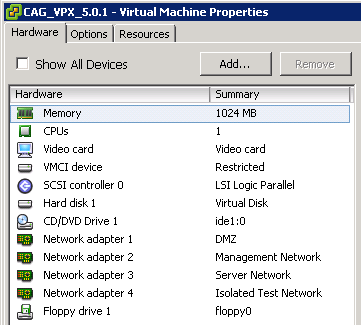 This walkthrough will only use 3 of the virtual network adapters. Feel free to set this up as preferred; it will work fine with just one network adapter configured for web access, management, and internal server communication. 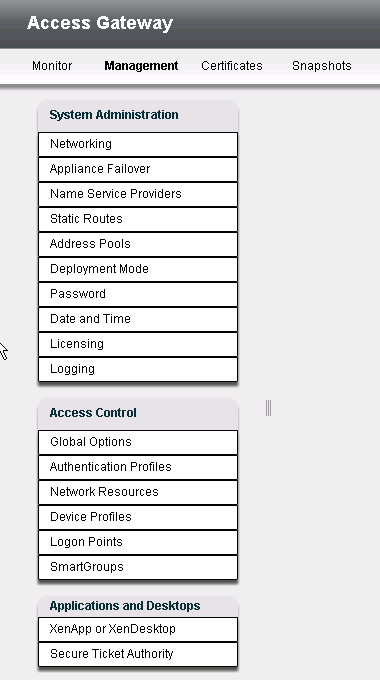 If this is a hosting environment, additional network adapters might be used to talk to different controllers. 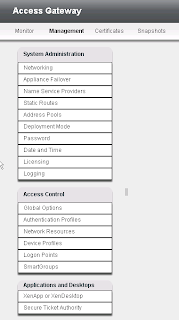 The ACM Web UI contains a lot of menus and settings, which will be left for another time, another article, or the excellent Citrix documentation at http://support.citrix.com/proddocs . Here we will skip to Part C regarding getting the SSL certificate to work with the Citrix Desktop Delivery Controller. And voila! The proxy connection type errors should be resolved. great document. i have on question about cag and xendesktop5. i want to use a dyndns adress to connect to the xendesktop 5 environment. if i follow your instructions i always get a blank page when i want to access the cag. do you have any tips ? Thank you for the comment dk! Regarding dyndns, I can see no reason why it shouldn't work, possibly if the external reverse-DNS and internal reverse-DNS points to a different IP address, this could cause a problem. I was able to export my Certificate from the Citrix Web Interface as a PFX, and import it into the CAG as a PFX. No conversion to a PEM at all. Is this incorrect? One issue i have found with dydns, you cannot get a SSL Certificate. I tried to get one through StartSSL and typed in my registered DyDNS domain and it said it was on a blacklist and subdomains are not supported. I ended up having to purchase a proper domain to test this.